Was Trump Saved From Mueller's Report By the First Amendment? Here’s what we know: Special Counsel Robert Mueller has turned in his final report, and Attorney General Bill Barr has written four pages about it. Those four pages have given rise to an inaccurate prevailing narrative on the far right and far left alike: Donald Trump was exonerated, and the Russia investigation was a bust. A scam, even. Those people can’t read. Either that, or they feign blindness. The overriding motivation, it seems, is not to weigh facts, nuance, and questions about justice: It’s basically to laugh at people, to convince yourself of superiority, congratulate yourself for being smart, and, of course, not having to think too hard about stuff. And given the misleading prevailing narratives—”no collusion!”; “total exoneration!”; “ha ha MSNBC!” etc—it’s easy to dismiss anyone doing what I’m about to do—point out some complicating questions—as being a sore loser, crying sour grapes over the whole thing. Yes, the media has a reckoning ahead of it: They (we) obsessed with the Mueller investigation itself—mostly because its tight secrecy made great fodder for otherwise smart people to speculate baselessly for months—and we weren’t aggressive enough about all the not-top-secret evidence of collusion and obstruction and rampant corruption staring us in the face for years. With so much weight on Mueller, fairly or not, nothing he could have said short of the impossible—”the President of the United States committed treason”—would lay that to rest. First, we haven’t seen the report, so anyone gloating now does so at their peril. It likely contains a lot of damning information about Trump and the effort to sabotage the 2016 election. But thanks in part to media myopia and miscalculation, the right-wing “no collusion” narrative probably won’t ever die now—despite oodles of plain and plenary evidence to the contrary. But when we stop laughing and scoffing and actually read, we find that Barr’s report leaves us with more questions than answers. I have a specific question here, but for a general view, here’s a great column by Neal Katyal—the guy who wrote the Special Counsel rules—hashing out the many problems with Barr’s letter. We won’t be able to say for sure what Mueller found, or what we can and can’t know about Trump, unless and until Barr releases the full report—which last week the House of Representatives voted he should do, 420—0. 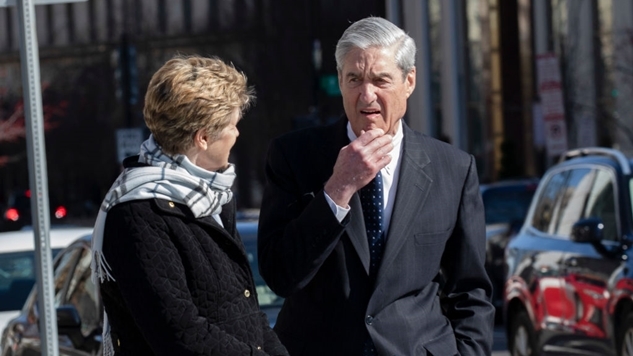 But we’re still left with the sand in our teeth: Why couldn’t Mueller establish the conspiracy crime, even with all the evidence available to the public? Well, Donald Trump might have been saved by, of all things, the First Amendment. This is possible because the First Amendment protects Wikileaks. I’ll explain. When you read over what Mueller’s indictments say about Wikileaks and its contacts with both Russian intelligence and the Trump campaign, it’s impossible not to see the conspiracy was very real: Russia >> Wikileaks >> Trump associates, and back the other way. Wikileaks is the lynchpin—the keystone in the bridge between Trump associates and the Russian government. 6. By in or around early August 2016, STONE was claiming both publicly and privately to have communicated with Organization 1. By in or around mid-August 2016, Organization 1 made a public statement denying direct communication with STONE. Thereafter, STONE said that his communication with Organization 1 had occurred through a person STONE described as a “mutual friend,” “go-between,” and “intermediary.” STONE also continued to communicate with members of the Trump Campaign about Organization 1 and its intended future releases. And we also know Mueller uncovered a sophisticated, years-long government-run Russian conspiracy to interfere with the 2016 election along two tracks: Hacking DNC information and disseminating them via WikiLeaks, and using the “Internet Research Agency” as a front to create and spread misinformation on social media sites via millions of posts that reached 126 million Americans on Facebook alone. That effort was, per Mueller and U.S. intelligence reports, designed to support Donald Trump’s campaign, damage Hillary Clinton, and sow political discord generally—including between factions on the left—and one year ago, Mueller indicted Russian military intelligence (GRU) agents for it. That’s insane. That happened. To us. We were manipulated, and, as all the hot-take, hall-of-mirrors backlash-on-backlash-on-backlash shows, it’s still working. But, weirdly, Mueller never indicted the people directly responsible for knowingly publishing information stolen by the Russian government. Wikileaks, it seems, got away with it. But according to Barr’s letter, Mueller writes in his report that ”[T]he investigation did not establish that members of the Trump Campaign conspired or coordinated with the Russian government in its election interference activities.” Truth is, Mueller’s bar—proof the Trump campaign knowingly engaged in a specific criminal conspiracy directly with a foreign government beyond a reasonable doubt—was quite high, and the fact that Mueller didn’t “establish” that crime (his word) doesn’t mean, as the misleading narrative goes, that he couldn’t find evidence of that crime, let alone of collusion. Wikileaks factors directly into the obstruction charges Mueller brought against Stone: He made “multiple false statements to [Congress] about his interactions regarding Organization 1, and falsely denied possessing records that contained evidence of these interactions.” That’s important because for a lie to be considered perjurious or an act of obstruction, the lie has to be about something important, something central to the case. So Mueller has hard evidence Stone had indeed lied about Wikileaks contacts. Why would Stone lie to Congress if he didn’t think he was doing something wrong, if not outright illegal? Stone at the time might not have even known it was not illegal. In 1971, the U.S. Supreme Court decided in New York Times v. United States that the First Amendment granted the press the right to publish the classified Pentagon Papers without facing of censorship or punishment from the U.S. government. (A Department of Defense employee—Daniel Ellsberg—leaked 43 volumes of a 7,000-page report on the Vietnam War to the Times, which began publishing articles on them.) The constitutional freedoms we afford the press might have shielded Wikileaks—and by extension, their interactions with both the Russians and the Trump team—from criminal charges. The Conspirators, posing as Guccifer 2.0, discussed the release of the stolen documents and the timing of those releases with Organization 1 to heighten their impact on the 2016 U.S. presidential election. Many analysts believed Mueller left Wikileaks unnamed because he planned to charge them specifically in a later indictment. But in hindsight, he might have left them unnamed because he realized from the beginning they were as a member of the press beyond the reach of the U.S. government. In fact, Mueller makes it clear that Wikileaks has done this sort of thing before—and they’ve never been charged. The First Amendment may have limited Mueller from pursuing criminal liability for any activity involving Wikileaks—and considering the fact he didn’t indict the organization for conspiring with Russia in crimes that actually got Russians indicted, there’s not a bad chance that’s the reason. This is why we need to see the full Mueller report: There might indeed be wrongdoing here, but because Wikileaks was the cutout, the evidence of direct criminal conspiracy between the Trump campaign and the Russian government won’t get us beyond a reasonable doubt. And if Trump and the GOP truly do feel “completely exonerated,” there shouldn’t be a problem, right? If so, how sickeningly ironic our constitutional free press protections shielded, of all people, Donald Trump.